In past posts, I have discussed the charging document that initiates court proceedings and the value of effective motion practice. I also touched briefly on the idea of pleadings. This post focuses on the various things that happen in open court. Whenever I am asked by new attorneys to “show them the ropes,” I usually take them to observe a judge with a Master Calendar docket. Although each case may only be in front of the judge for 10-15 minutes, the docket may take several hours to complete. At any given docket, any or all of the following might occur: a respondent might ask for more time to find an attorney to assist in her defense; the government might request more time to obtain documents to support its prosecution; a respondent might decide that she wishes to leave the United States and request “voluntary departure”; a respondent may enter pleadings to the charges, which then signals to the judge the strategy that he intends to pursue; a respondent may submit an application for relief and supporting documents; an attorney may persuade the judge that a particular case could be resolved by USCIS without the judge’s further involvement; or the judge is satisfied that all of the preliminary requirements have been met and that a case is ready for trial. On a typical day, there may be 30-40 cases that are scheduled on a Master Calendar docket. In contrast, there are usually only 2 to 4 cases set for trial at an Individual or Merits hearing. At these hearings, the judge will hear testimony from the respondent and any witnesses. The main purpose of these hearings is to determine if the respondent has satisfied the “burden of proof” required for the judge to grant relief in the case. Sometimes after the hearing, the judge will be prepared to render a decision on the case. 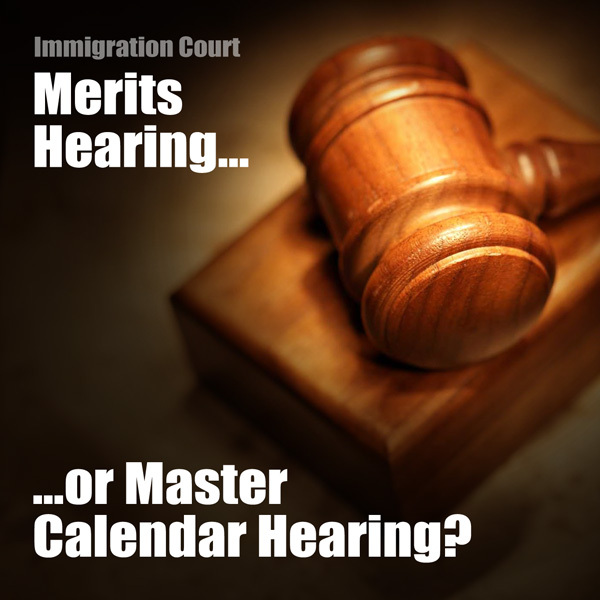 The judge may terminate proceedings or grant a form of relief that results in lawful permanent resident status. Or, the judge may deny a case and provide a detailed decision providing the rationale for the decision. If the judge denies a case, there is a very limited window of time in which to file an appeal. If you are looking for an attorney to assist you with the complex maze of immigration law and procedures, I invite you to contact me.